An attachable orthodontic dummy with a red spotty ribbon. Pop-itz are the new innovation from Skibz. Easily 'popped on' to Skibz Doublez dribble bibs, these handy little attachments stop babies' teethers and soothers going missing, and keep them clean and close at hand. Skibz Doublez bibs with Pop-itz Suckerz are the perfect duo for your baby's comforting needs. 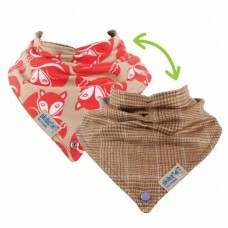 Suckerz are easily attached to the dribble-catching Skibz bandana bibs to keep a soother clean and close at hand, making this innovative combination the solution to keep babies content and comforted. Yet another problem solved by Skibz! Easily sterilised. Please sterilise before use. Immerse in boiling water for 5 minutes. Suckerz soothers promote healthy jaw development with an orthodontic teat. Evidence suggests that the flatter shape of the teat is better for your baby's mouth development than the traditional cherry-shaped alternatives.